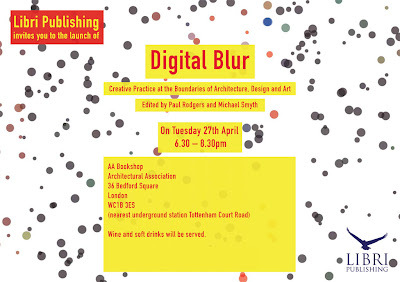 This book Digital Blur — in which John Marshall and I have a sort of drunken, double-bandolier-wearing bandito-style essay on *undisciplinarity — will launch on April 27th in London at The Architectural Association Bookshop, which is a fantastic bookshop anyway so you basically can’t loose. if anyone goes..i wouldn’t mind a photo of the event just to show my mother what i have wrought, in my own humble, minuscule way. On behalf of Libri Publishing I am delighted to invite you to the launch of Paul Rodgers and Michael Smyth’s new book. A formal invitation is attached. The nearest underground station is Tottenham Court Road. Wine and soft drinks will be served. We hope you will be able to join us.